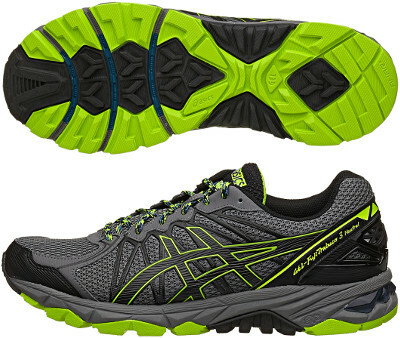 Asics Gel Fuji Trabuco 3 are neutral trail running shoes. The Asics Gel Fuji Trabuco 3 is the new update of the most versatile and popular trail running shoe featuring cushioning and comfort as usual but with more Gel®. Several changes in this version: outsole has been redesigned targeting better traction on all terrains through reversed lugs, overlays have been removed from upper to increase breathability and traditional tongue has been replaced by MONO-SOCK® system providing sock-like fit. As well as its predecessor the Asics Gel Fuji Trabuco 2, GEL® cushioning is available in both rearfoot and forefoot for outstanding cushioning and there is a rock plate to protect against stone bruises. Base model is intended for neutral runners but there is a variation for overpronators using dual density foam (DuoMax®) in the midsole. Both are also available with GORE-TEX® upper designed to protect the foot during extreme weather conditions.